Robin Street Market - The Market Blog: Food Trucks! 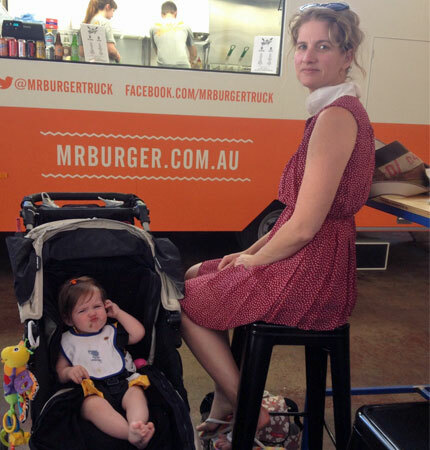 We have been checking out a couple of the Melbourne food trucks recently. First we popped into the CBD to grab a burger from Mr Burger - I was hoping for a veggie option but they hadn't introduced them yet (they should be available by now) - so I went the meat burger - even though I'm not usually a fan of burgers (unless I have made them myself and I know the meat is good quality) - I really enjoyed my Mr Burger burger!! David was also a big fan - Georgie even enjoyed a bit of a nibble (not that you can tell by the funny face she is pulling in this photo). 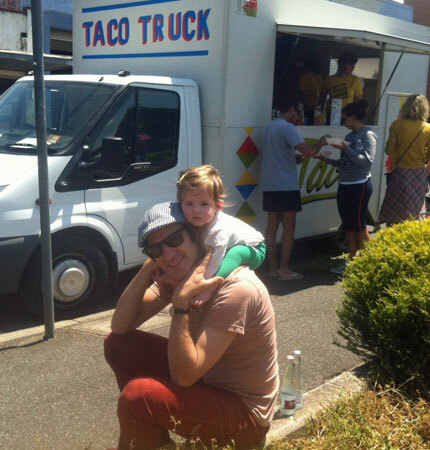 So, because that was such a successful outing, we thought we would pop past the Taco Truck when it was in Brunswick. And I'm pleased to say that it was another yummy meal - I had the fish tacos which were really delicious. Go the food trucks I say - fun and yum!